A common question Exchange users want to know is how to access shared calendars and contacts on a smartphone. If you using Office 365, Outlook.com or a version of on-prem Exchange that supports the new calendar sharing model, you can open the shared calendar in your mailbox and it will sync to the phone. If you have an older version of Exchange or want to sync a calendar shared (as an .ics) from another network, you can add a link to the shared calendar in Outlook on the web, which allows it to sync as a calendar within your mailbox and sync to devices (and to Outlook). The negatives? The iCalendar file may be slow to update and it is read-only in Outlook for Windows. If the calendar is shared from Office 365 or Outlook.com, it will be editable in Outlook on the web and on mobile devices. This works with any shared calendar, including Gmail, where the calendar is shared using an iCalendar (.ics) file, or with the sharing invitation created by Outlook on the web. A sharing message opens. Add the address and set permissions, then send. Office 365 shared calendar notifications sent to addresses on Office 365 contain an XML file, not a link. The message will have the .ics link when sent to addresses outside of the organization. If needed, the mailbox owner can get an .ics link from the Calendar Permissions property page. Right click on the calendar, choose Permissions the right click on the Subscribe to Calendar link. The ics link should only be used if the calendar is shared with someone not using an Exchange mailbox. To share a calendar in a shared mailbox you have access to, open the shared mailbox in Outlook on the web using the Open another mailbox command (click on your photo or the person icon in the upper right to expand the menu), then follow the steps above to share the calendar. Group calendars and Public Folder Calendars cannot be published or shared. 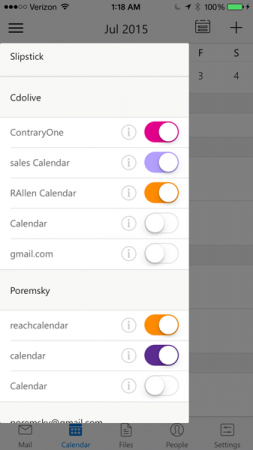 Although you can open the .ics file as a published calendar on Apple devices and in Outlook desktop, it's a read-only calendar. If you open the sharing invitation or iCalendar link in Outlook on the web, it's stored in your mailbox and is available everywhere you open your mailbox. If you use the Outlook app for iOS or Android, you'll need to add the calendar to Outlook on the web as you can't subscribe to calendars separately. 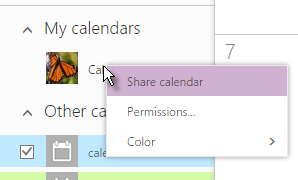 If the calendar was shared from Office 365 or Outlook.com, accept the sharing invitation from Outlook on the web. This will add the calendar to your mailbox. Within a few minutes it will sync Outlook desktop and mobile devices. 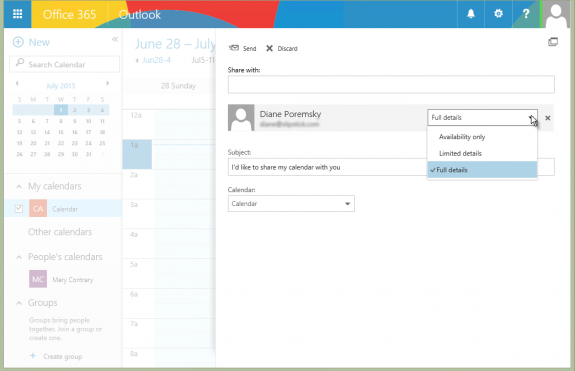 The calendar opens in Outlook on the web. It will sync down to Outlook within a few minutes. The calendar can be renamed. Wait a few minutes and open the Calendar app on your smartphone. The new calendar should be in the Calendar list on the native Apple and Android apps and in the Outlook app on both Android and iOS. Warning: it can take a very long time for new appointments and updates to sync to other devices. Changes and updates will be delayed. HELP! I have downloaded the Outlook app on my iphone and it's working fine. I need to be able to see (accept) a shared calendar a colleague shared and I can't see it when I click on it, it's all garbled. How do I accept it? Accept it using outlook on the web if its not working in the outlook app. Thank you for the AMAZING job you do on this website, it's been a staple for me for years to find good information on Outlook. Are you aware if it's possible to change the default view of a published 365 calendar so it shows "week" instead of "month"? As far as I know, no, but i will double check. Can you tell me how to do this in Outlook 2010? The outlook version doesn't matter - you need to set it up in the smartphone's mail client. Sorry about that. I accidently approved it when i meant to hold it and see if the product was listed in our tools database.